What a n00b! (old posts, page 1) | What a n00b! 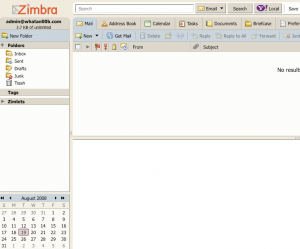 The Zimbra Desktop mail client is a great mail client that gives the look and feel of the Zimbra Collabroation Suite, but the migration path out of the client has been less than easy. I wrote up a quick tutorial on steps that I took to help someone pull their email they had downloaded via POP into ZD and had gotten stuck there. 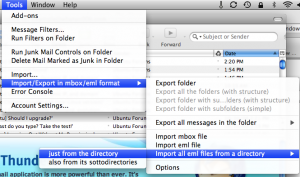 To do the export of the data, I used the built-in export utility inside of Zimbra Desktop. 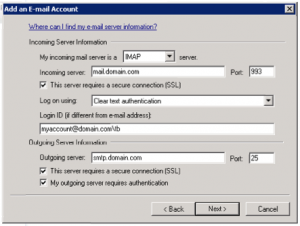 For the migration into an IMAP account (or a Zimbra Collaboration Server account) I used Thunderbird with the MboxImport enhanced add-on. 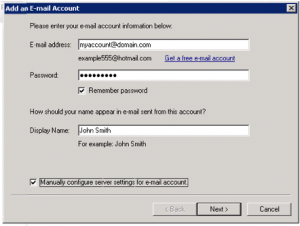 I'm assuming you have already setup the account in Zimbra Desktop and pulled down the emails you want to export. 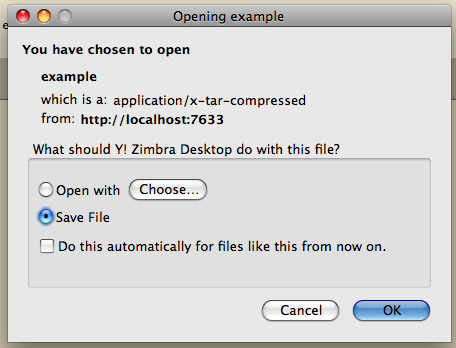 I'm using Mac OS X to do the export, though it should work assuming you can get a file to extract the gzipped tarball from Zimbra Desktop. 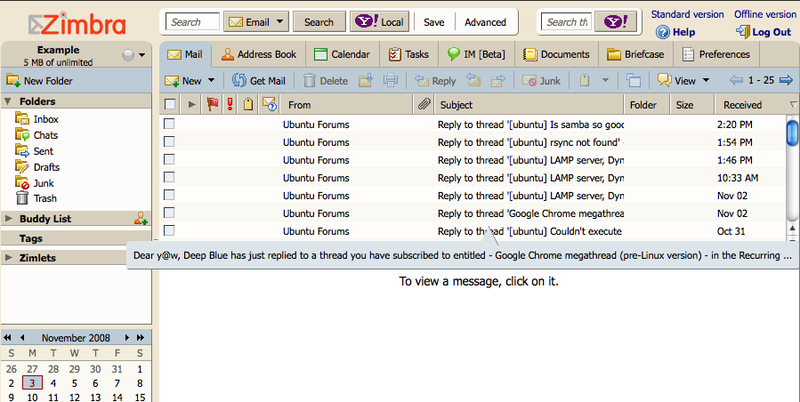 First, I started with exporting from Zimbra Desktop. I went to the Account Setup page using the bottom on the top-right. In the account setup screen, click on the account you want to migrate. On the bottom-left, click on the Manage Data button. Type in the name you want to give the file, then click on Export. Then you'll be prompted to save the file. Save the file wherever you would like. Mine saved to my Downloads directory. For some reason, it didn't actually name the file the way it was supposed to when I downloaded it it, so I renamed the file to example.tar.gz and double-clicked it to extract. If you're using Windows, 7-zip can extract the file. When you extract the file, you can open the folder and find directories for each folder of the mail you had. Inside those folders, there will be .eml files for each email. If you have more than 500 messages in a folder, the export breaks them up into multiple folders and append a number to the end of the name. 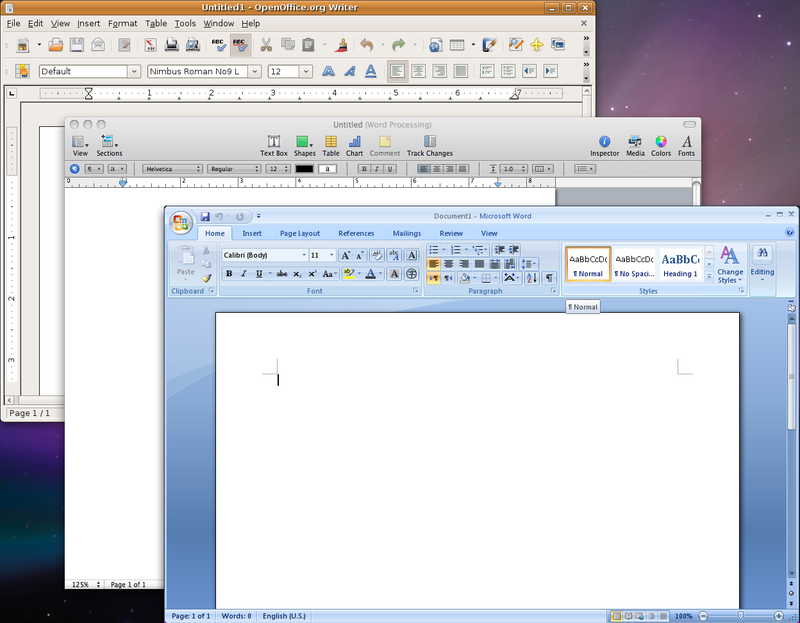 Now we're ready to import into Thunderbird. It's useful at this point if you account is setup already, but not necessary. First, we'll have to create a temporary local folder to import into. 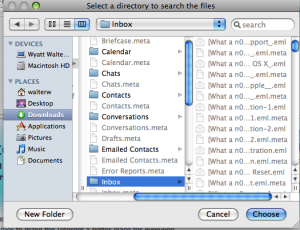 Right-click on the Local Folders in Thunderbird and click on New Folder. You can name it whatever you like, it will be cleared out eventually anyway. Then, select the new folder we created. 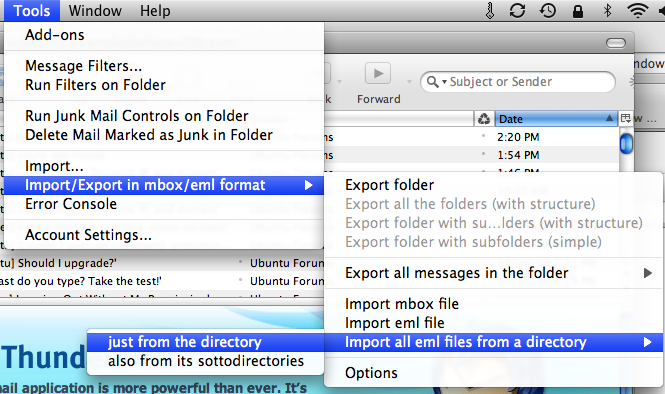 Then, in the Thunderbird menu, go to Tools -> Import/Export in mbox/eml format -> Import all eml files from a directory -> also from its sottodirectories. 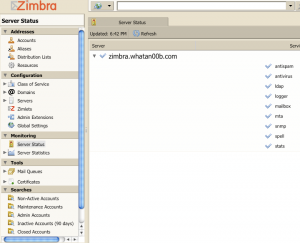 When prompted, navigate to your extract Zimbra Desktop export directory and click Choose. The utility will import your messages into the temporary directory. 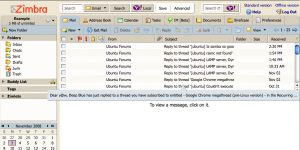 After spending a great deal of time the Zimbra forums helping others setup DNS and other assorted issues to get Zimbra servers up and running, I decided to create a quick tutorial on how to get up and running with Zimbra on Ubuntu 8.04. 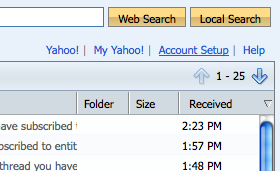 For my installation, I'm using zimbra.whatan00b.com as my hostname and my IP is 10.211.55.9. I'm going to use i386 Ubuntu 8.04 server and Zimbra OS 5.0.7 (Zimbra 5.0.9 was actually released for the Ubuntu 8.04 platform during my writing, but at the beginning, 5.0.7 was the newest package available.). I used Webmin for management of the DNS server. it's a little bit overkill for this project, but it seems to give beginners to bind some 'training wheels' for (hopefully) a slightly less steep learning curve. A small amount of Linux knowledge and comfort with the command line is required. The partitioning and installation is outside the scope of this tutorial, but to begin I did a default install and picked the DNS server and SSH server "bundles" during the installation. 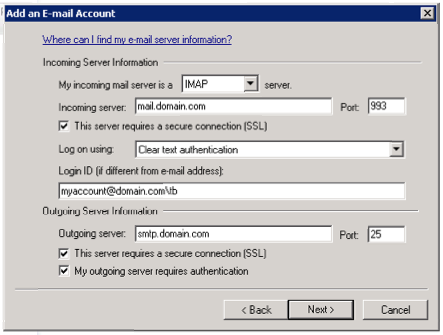 You can run Zimbra on an existing web server if you should choose, but it gets a little more complicated and is outside the scope of this document. I am also assuming that the server is behind a NAT and you have properly configured all public-facing firewalls and DNS. For the setup, we will follow the Zimbra wiki steps on configuring a "Split DNS" for internal DNS resolution. Before we get started, I want to add a disclaimer. This quick tutorial is meant for use in a proof-of-concept testing environment and to get a quick overview of the components necessary to get going. Please do not follow these steps and consider the machine production-ready. I do not cover setting up SSL on the web client or other services (the administration console uses SSL 'out of the box'). With that out of the way and since we only have an hour, let's get going. Once completed, you can connect to Webmin using a web browser on another machine. Since my example server is at IP address 10.211.55.9, I'll connect to: https://10.211.55.9:10000. You can login with any user that has sudo access or with root. 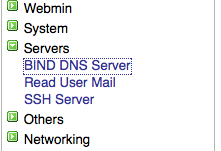 After logging in to Webmin, click on Servers, then click on "BIND DNS Server". Then click on "Create master zone". You will need to create an "Address" with the same name as your hostname. You can leave the Name blank empty and fill in the hostname (with a "." at the end, remember) for the "Mail Server" blank and a priority of 10. Once you are done, apply the changes for the zone. whatan00b.com. 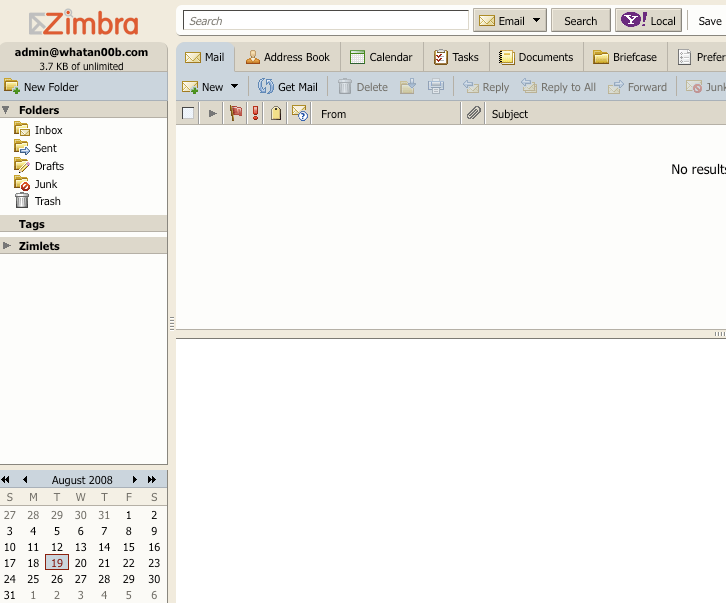 38400   IN  MX  10 zimbra.whatan00b.com. whatan00b.com. 38400   IN  NS  zimbra. The installer will get going and have you accept the license agreement and check out prerequisites. If one is missing, you can do a quick sudo apt-get install for whatever package is missing. I accepted all the default packages (ldap, logger, mta, snmp, store, apache, spell). Then you'll want to type 'y' to continue the installation. The installer will then install the core packages on your system. Once that's done, we begin the configuration. You will then be taken to the Zimbra configuration wizard. 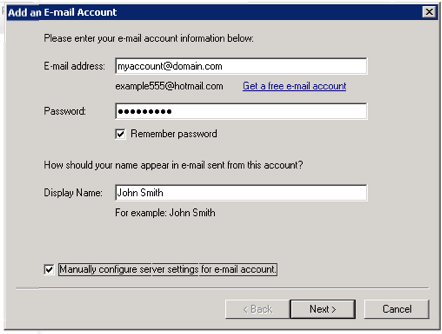 You can set any of the preferences you like, but the only required one is to set the admin username. You use the numbers and letters to navigate the menus to set properties. To set the admin user password, you first type '3' to get to the Zimbra "Store configuration" menu, type '4' to set the password. Then you use 'r' to get back to the main menu and 'a' to finish. The installer will take some time to finish and the time it takes really depends upon the hardware you're using. I used a virtual machine inside Parallels on my MacBook so it took about half an hour to complete. At the end of the install it will start the services for you. Once through the install, hop onto your favorite web browser and see if you can log in. 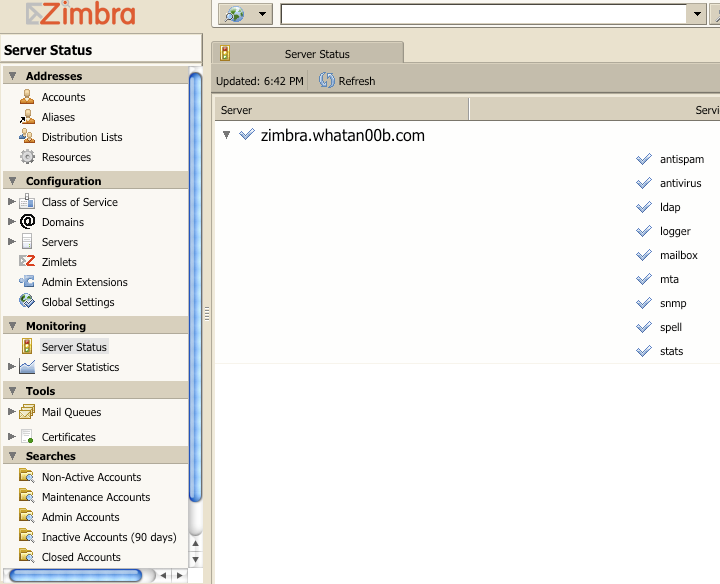 For my instance, I navigated to: http://10.211.55.9 and up came the Zimbra sign-in page and logged in. You can login to the administration console at https://10.211.55.9:7071 after accepting the self-signed certificates, of course. Once into the administration console, you can go ahead and start adding domains and users at will. That's it! You're ready to start hacking away. If you're stuck on a step, feel free to ask in the comments below or post in the Zimbra forums. For more info on tuning your Zimbra server, check out my article on tuning Zimbra to use fewer resources. 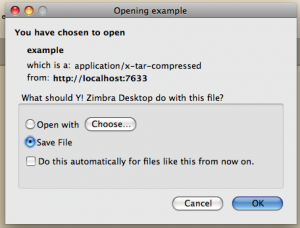 For do-it-yourself troubleshooting or a deeper understanding of what's going on in this setup, you may also want to check out my article on some of the pitfalls of Zimbra installation as well! I have recently been playing with several virtualization technologies and came upon an issue that I wanted to write about so I could help someone else who was having the same issues. 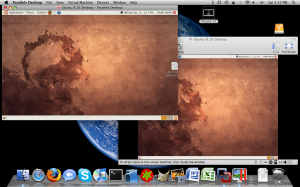 Currently I've seen this issue happen in Parallels 3.0 on Mac and VirtualBox on Mac and Ubuntu as the host. I've seen it happen only with Ubuntu server 7.10, but it's very possible that it happens with others. Boot from the CD using the "Rescue a broken system" option. Go through the regular options until you get to the rescue console. You will be prompted for the filesystem to use as the root filesystem. Choose your root filesystem and choose "Execute a shell in ". If you have a separate /boot partition, you will have to mount that before you can install the new kernel. This will install the generic kernel from the CD. Once the install is done, reboot the system. When GRUB is loading, press "Escape" on the keyboard to open up the kernel prompt. Select the generic kernel you just installed (not the recovery mode option). The system will boot up with your new kernel. Once the machine is booted up, you can login and use it as normal. You can change the GRUB settings to choose the generic kernel every time so you don't have to select it every time. Open up /boot/grub/menu.lst in your favorite text editor. In the first few lines you will find a line that says "default 0". You can change the default to the one you need by counting up from zero in order of the kernel listing in the file. For me, the generic kernel was "2" (remember, it starts with 0). Once you change the value, you can reboot the machine to see if the right kernel was selected. If you changed it to the wrong one, you can always use the "Escape" key to select a kernel at boot.